Sea Ranch is one of my favorite places in the world to run. Heading out about 8 am, I ended up running from the Vista Del Mar house to the Sea Ranch Lodge and back. In total, I covered almost 8 miles. A map of our bike ride is here. Phil made an early lunch about 11 am for the group at the Kyuka house, including steak and chicken. Afterwards, we got organized for a bike ride. Phil and the Renterias rented bikes like we did in February, while the Heringers, Larkins and Gainsleys all dragged bikes with them. In total, we had nine people on the bike ride. We road north through Sea Ranch for about 4 miles and then turned back around. Sharon dropped off at this point. The rest of us rode all the way to the Sea Ranch Lodge. 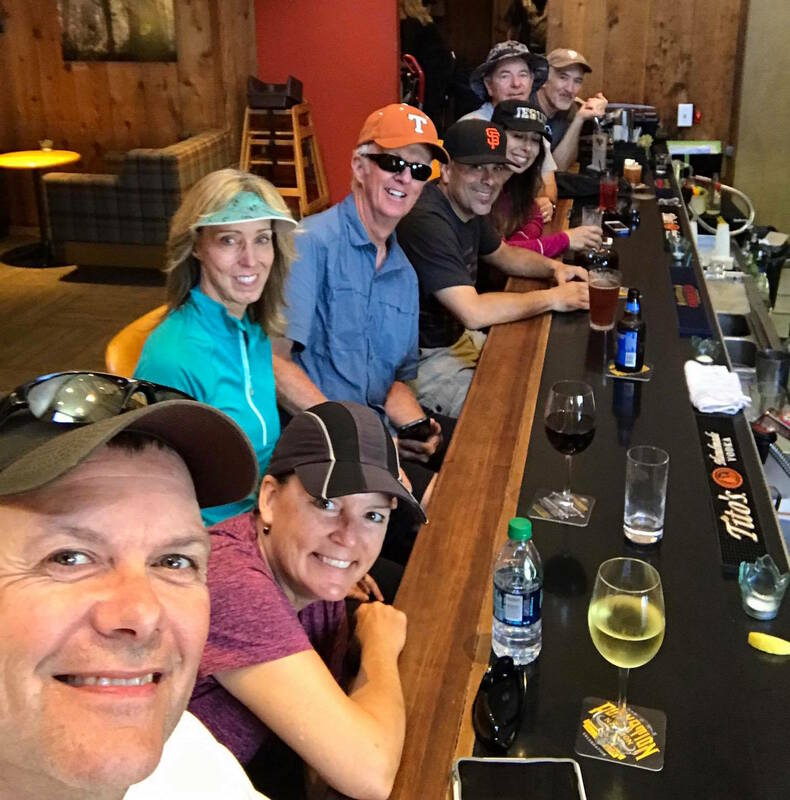 The group stopped for a drink at the bar in the lodge. I headed back by myself to get ready to help Sharon with dinner. I enjoyed the chance to put my head down and roll on the way back. In total, we covered about 17.5 miles. It was a great ride. I was surprised by the amount of dirt trail there was going south towards the lodge. Sharon and I got cleaned up for dinner and dragged everything over to the Kyuka house. It had a much better kitchen. Sharon made a great Flemish dinner. The menu is here! The main dishes were mussels followed by rabbit. We had a cake that I picked up on Thursday and we dragged over to the coast; the cake was very, very good. I had brought Alexa with us on the trip. The surprise of the weekend was how much of a kick everyone got out of requesting songs. After a 8 mile run and a 17 mile bike ride, I started to fade by the end of the evening.